I don't really know what happened, but we didn't end up with that many people photos, and some of the ones we did take were scary bad. I felt like I spent a good deal of the time dodging cameras myself. Nonetheless, there are plenty of strange photos of me appearing on blogland. On top of that, our roomie, Sandi Henderson toted around this cute little flip video and she's got Jenn and I shakin in our boots. Sometimes you'd turn the corner to find that little thing right in your face. A whole lotta dodging was going on. This is Simone Howell. 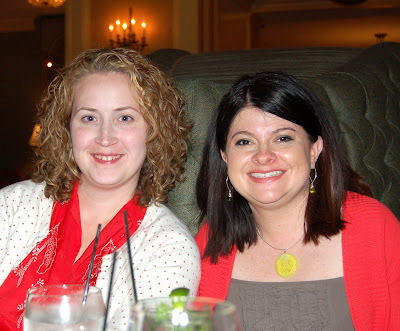 I have blogged about her a couple times before, but this was our first time to meet. She is as absolutely gorgeous as her handiwork. She made the handbags and jumper in my booth. She's a dream to work with because she "gets it". Her work is perfection. She exceeds my high expectations and makes everything even better with vintage ribbons, brooches and lace. Okay, just think I talked her up to the point she won't have time for me anymore. Trust me, you'll be seeing that cute face again..and again. Then, oh my goodness, I'm in LOVE with this couple. Brad and Jill of Lanie Jane. So fun and..oh let me just say it...Squeezable. We laughed and carried on as if we'd known each other forever. 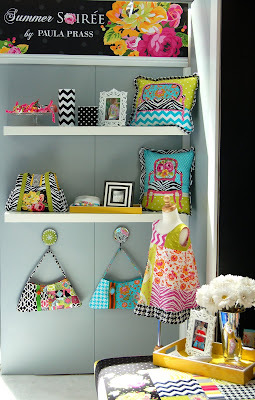 Along with their on-line fabric store, Jane also has a blog worth visiting. 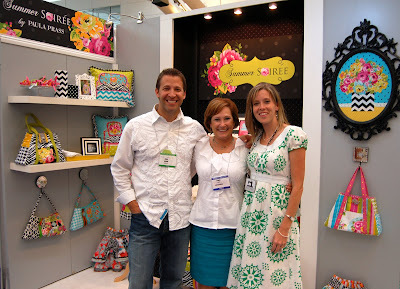 And what would Quilt Market be like without these two very dear friends? 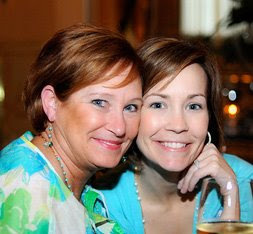 Sandi and Patty; not to be confused with Sandi Patty. Seriously, they are both wonderful, but you already know that, don't you? And of course, here is me and Jennifer, joined at the hip. Patty took this awesome picture of us with that new camera of hers (picture below). So professional looking, huh? Sandi, Paula and Patty soaking our pained feet before we took off for the Michael Miller dinner. We took lots of pictures of Patty's Birthday surprise , but I think this one is her initial response. Looks like Myrinda was trying to scare her. Funny. Well, that might be it for now. 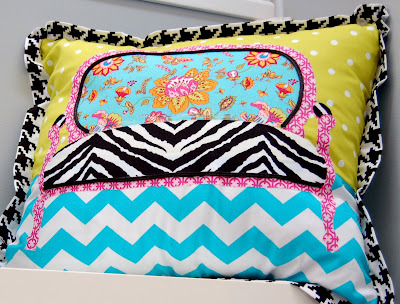 Now don't forget to go to Dana's and sign up for that Quilt Along/Giveaway. 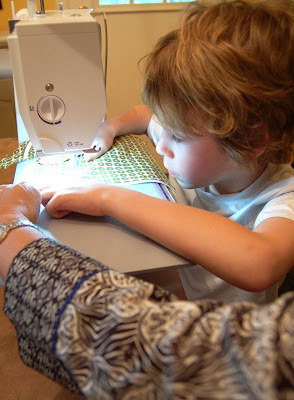 Free quilting lessons from the best! Wow, I seriously think I am a week behind. Yesterday I noticed several people wishing me a good weekend. Had no clue that this was Memorial weekend until Jennifer broke the news to me. I lost a whole week. Where did it go? I must have lost that week during Quilt Market. I handed out flyers about this incredible Quilt Along and told everyone it would begin after Quilt Market. Not so. It's already underway, so if you're just tuning in, let's not waste another moment! This is BIG! 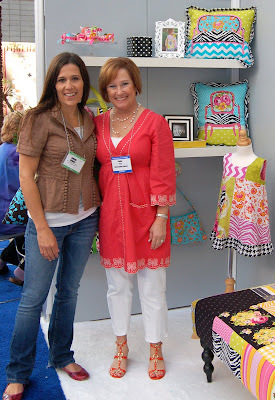 Do you remember Dana @ Old Red Barn Co. and her amazing Quilt Giveaways? Well, she has truly outdone herself this time! 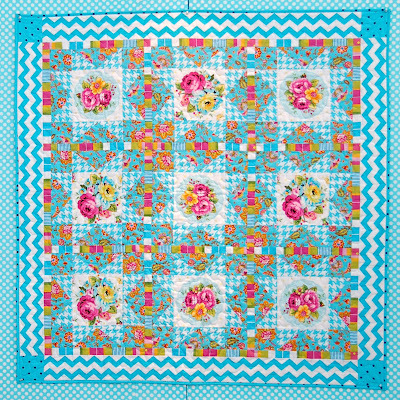 Dana has planned a six week Quilt Along with weekly Give Aways. Go get a better look at this Grand Prize. 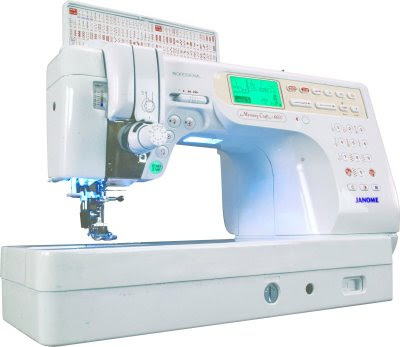 Yup, it's the Janome 6600 sewing machine. Told ya! Hold off all your Memorial weekend plans until you can get over to Old Red Barn and get signed up. Dana is going to give you impeccable instructions. I understand that you get extra points for using my Flights of Fancy fabric! 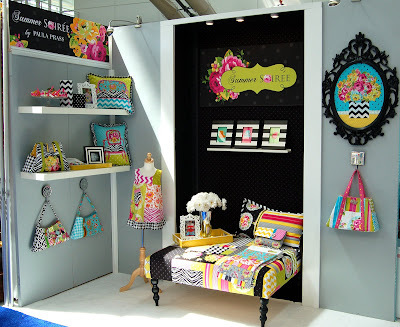 I saw some of my e-stores at Quilt Market and they said they restocked the Flights of Fancy for this event. 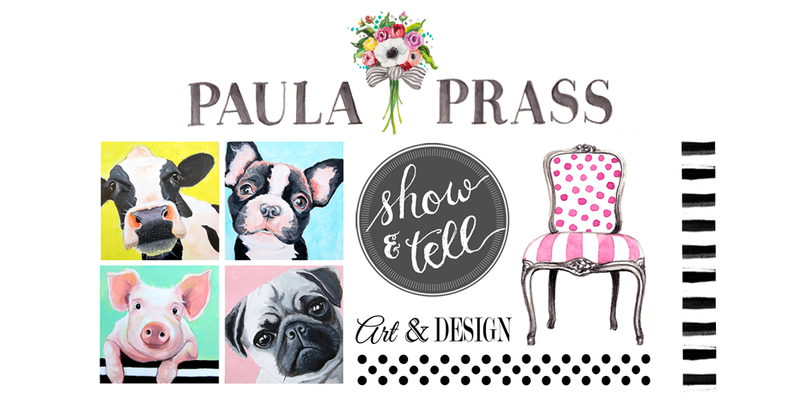 Besides the wonderful Dana, I also wanted to introduce you to Sarah Pead, the graphic design student that worked on the artwork for this Give Away. I find Sarah's website fascinating, as she puts her actual school projects online. Boy that brings back memories! Go say hello. 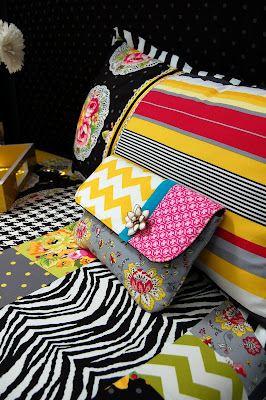 I know I have so much more to share about Quilt Market, and lots of people to talk about, but this post became a priority. Maybe next week will truly be next week for me. For those of you who didn't make it to Spring 2009 Quilt Market or didn't make it over to my neck of the woods in the huge convention center, welcome to my humble booth. Today I will concentrate on the booth, then I'll do the gloriously amazing people next. How self-centered is that? Hugely, I admit, but also the first few of a hundred + pics on my camera. I was given a 4x8 space this time, so instead of cramming it full, I chose to have a patchwork theme to represent the 40 new fabrics in the Summer Soiree Collection for Michael Miller. I can handle busy in a clean, organized kinda way, ya know? So here it is. The ottoman is just a reflection of some fabrics in my new line and actually includes strike-offs (not the real deal) since I didn't have fabrics til the last minute. My man made this ottoman for ME and ultimately our family room! If I can figure out a way to come up with cool ottoman legs I'd love to provide an ottoman tutorial for you all. I love the big chunky balled legs and couldn't find them anywhere. I actually bought an ottoman and took the legs off to use on my own version, I was that desperate!! Anyone have some big, fat, round, layered ball legs (and not our own, my ladies) please let me know. 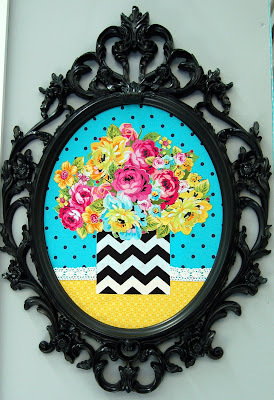 Next in the booth is this collage I made with various florals and base prints from the new Summer Soiree Collection with a bit of vintage lace encased in an IKEA frame. My inspiration came from the arrangement Kathy Miller sent me when I destroyed my arm/shoulder immediately after signing on w/MMF. All I know is that after such a severe break, I could only hope for some mobility. Dr's kept referring to my break as "bad; really bad". It is now my personal miracle. Seriously, I sign my name, paint and draw from the same arm that was totally not connected. What can I say? I still am amazed that planes can fly. Here is my Oh Jackie! handbag that is soon to be a pattern. I have been refused entrance until I hand over the bag. Hope the pattern is hugely popular and available. Hows that for optimism? A settee pillow. Yes, I will make this available. Do I lose sleep for nothing? Soon, very soon. 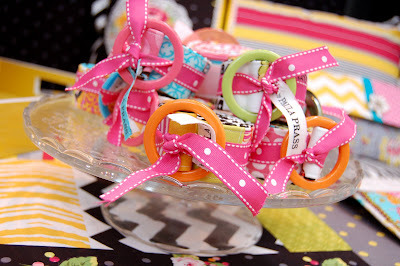 These are belts rolled on a cake plate. If you just buy them to wear these will make for a very pretty waistline! This is a quilt that was within the MMF area. Hope the quilt pattern is available thru MMF. IMPORTANT NOTE: Paula holds visuals in a much higher priority than words. If in this post you come across words, they are only value added. and only be used to enhance the visual. MODEL: Jennifer Storey JEWELRY: Stella+Dot Happy Necklace and a HANDBAG: made by Simone of Gardenhouse using the new Summer Soiree fabric, vintage brooch and ribbon. Droll anyone? 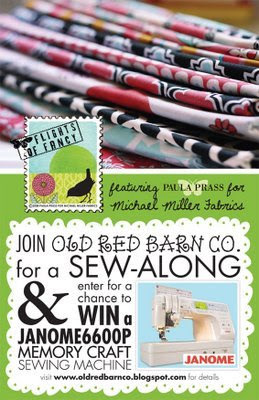 It's hard to believe that it was a mere 7 months ago when I debuted Flights Of Fancy fabrics for Michael Miller. So many wonderful recorded memories, fabulous people and continued friendships. Now my crate for the upcoming Market is closed up and on it's way. I'm still working last minute and will hopefully have time to clean up my debris before heading for Pittsburgh. If you aren't going to Quilt Market in Pittsburgh (Let me know if you are! ), we'll take good photos there and a much better reveal of the whole line once we return. I have so admired Simone's handbags and clothes for some time, but when I got the first batch of goodies she's whipping up in Summer Soiree I literally teared up. Her workmanship is impeccable and so is her ability to mix it up. All her bags have vintage brooches, ribbons and a unique combination that is to die for. I ran a couple errands using one of the bags and got serious compliments. People coming to my studio are drooling over them ( I know, they clean up nicely though). She is also test sewing a bag that my husband helped me design...stay tuned for that one. All I'll show you for now is the handbag above and this adorable jumper modelled by my Miss Amelia. Here's a pillow I'm working on. 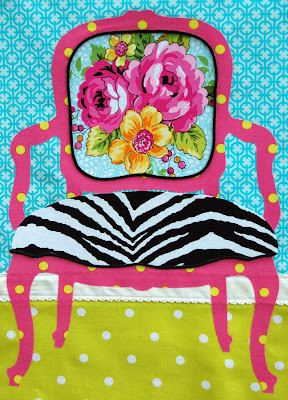 I love french chairs and am having quite a bit of fun making some collage pillows and artwork for the show. Then I got a pleasant surprise yesterday when Kay Whitt sent me a couple quick pics of some things she's taking to Market. 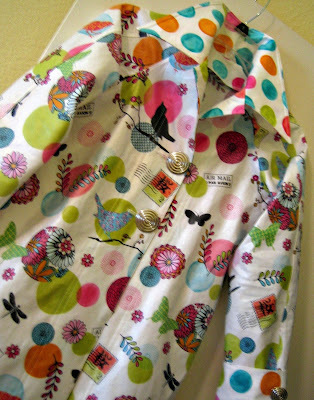 This is her Sophie Trench Coat pattern using my newly laminated Par Avion and Rain Dot in the Spring colorway. Whoa. Thank you Kay! I'll have to check on when the laminate will be up on the MMF site, but it is available. She told me it was great to work with. Yeah!! 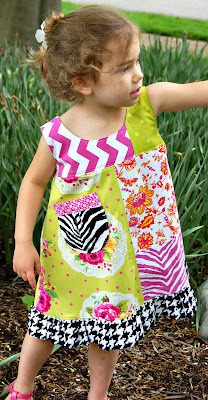 I can't wait to see that and another goodie she made with my new fabric. 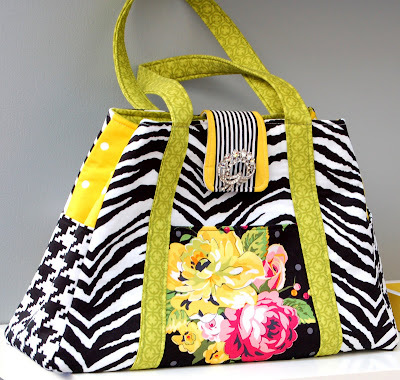 Hope this has been enough to get you to wander over to my booth during Quilt Market. Lots more to see and learn about an amazing upcoming humungous giveaway. Yes, you heard me right. It'll knock your socks off. Okay, I know, you're probably not wearing socks. Just trust me. 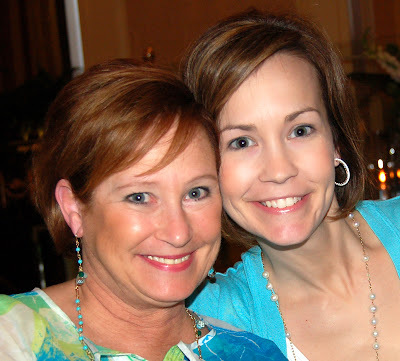 Lastly, you've got to go check out my Jennifer's blog. Whhaaa? Remember I was on the front of the March Carmel Magazine? Well, the crew took one look at my fashionable daughter and next thing I know she's on the cover of April's Hendricks Magazine. I gave her strict instructions to run if the photographer wanted to shoot UP at her. Well, she took mom's advise. Whatcha think? Much better material to start with and much better results. 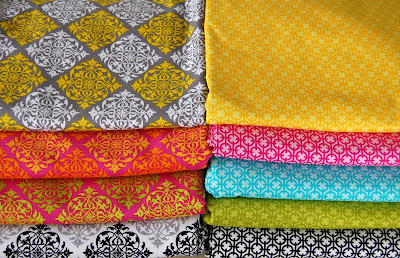 Here is the remainder of the Summer Soiree fabrics that arrived recently. On the left are the Best Friends (get it? Diamonds?) and on the right is Cufflink. We have been running around working on numerous projects and events, so a full reveal will be coming soon. Next week? I hope so! We are in the midst of a local Private show that started yesterday and goes for 2 more days. When this is over, I'll be back at the sewing machine and pulling all nighters. Oh, speaking of the sewing machine, here's a photo of Wyatt trying out a spot at the ol' machine.